Enceladus’ icy geysers contain particles of silica and methane hinting at hydrothermal activity. Ever since their discovery by the Cassini spacecraft in 2005, the plumes of icy particles that are being fired into space from deep gashes along the southern pole of Saturn’s moon Enceladus have intrigued planetary scientists and astronomers immensely. Here we have a world in our own Solar System, relatively not so far away, where all evidence points to a subsurface sea of considerable volume and depth containing salts and organic compounds – not unlike our own ocean – and, based on recent analysis of data collected by Cassini, there are likely also heat sources in the form of hydrothermal vents. The conclusion of hydrothermal activity is based on findings reported in two separate papers by international teams of researchers. In a nutshell, tiny grains of silica, found both in orbit around Saturn and in the plumes emanating from Enceladus’ southern hemisphere, are of such consistent sizes (6 to 9 nanometers) that a certain process would have to be in action producing them. The likeliest scenario, the researchers determined, was hot water at near-boiling temperatures carrying dissolved minerals from the floor of Encealdus’ subsurface ocean relatively quickly through higher, cooler depths and finally ejecting them though cracks in its crust out into the coldness of space. The other “smoking gun” (pun intended) for hydrothermal activity inside Enceladus is an abundance of methane within the plumes. It’s thought that geologically-produced methane, released in large amounts from vents, fills the moon’s ocean in higher quantity than can be fully cloistered away within pressurized ice crystals – aka methane clathrates – and gets sprayed out in the vapor plumes. 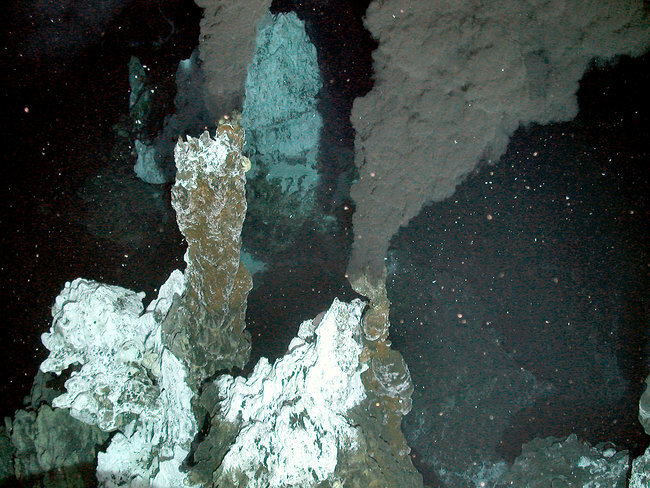 A deep-sea hydrothermal vent on Earth. Credit NERC/NSF Chesso consortium. Hydrothermal vents were first discovered in the depths of Earth’s oceans in 1977. Although located out of reach of sunlight and in conditions of extreme pressure and heat, they nevertheless create environments where many types of organisms can thrive. On Earth the water erupting from vents can reach temperatures of over 700 degrees F (300 degrees C). Although Enceladus’ vents are only likely a third as hot, they would still be a considerable source of heat energy 20-plus miles beneath the moon’s frozen crust, where surface temperatures drop to -330 degrees. Previous measurements by Cassini have found the sources of Enceladus’ geysers – nicknamed “tiger stripes” – to be considerably warmer than the surrounding crust. Read more on that here. The research has been published in the journal Nature and in Geophysical Research Letters. Read more on the Cassini mission site. Reblogged this on Into Everlasting. Wowww !! Here a very good new. And if the life is harbored in the subsurface Enceladus’ ocean… Go to send a probe to investigate that ! !